Asset Tracker for Networks completes all tasks one can expect from the software of this kind. We have listed the main program features below; if you are looking for a certain feature that is not listed there, you will find it in the program after downloading the trial version. - WinSock information: TCP/IP addresses, host names, etc. 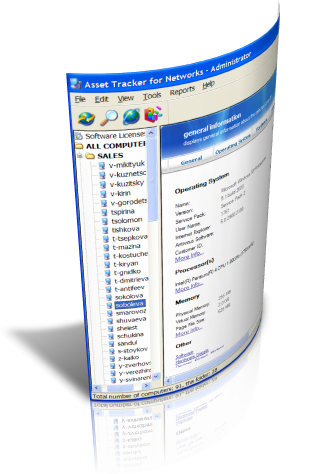 Asset Tracker for Networks does not require any software to be manually installed on each and every user workstation. After installing the program on your own PC for the very first time, you click File|InventoryNetwork menu item and... get the complete inventory report in a half an hour! Asset Tracker for Networks will export collected inventory information to various information storages, including any ODBC-compatible database, "Comma-separated values" (CSV) files, Microsoft Excel spreadsheet and so on. This inventory software will provide you with the printable comprehensive reports. Report Builder is an additional tool included into the Asset Tracker for Networks installation package. Using Report Bulider, you can modify any of the existing reports or create a new one if necessary. Report Builder uses SQL queries as data source, it has powerful built-in macro language and rich formatting features that allows to create complex reports meeting any requirements. Having powerful capabilities and rich features, Report Builder is a pretty simple and easy-to-use application.